Set the order in which your applications launch. Is there a better alternative to OrderOfLaunch? Is OrderOfLaunch really the best app in System category? Will OrderOfLaunch work good on macOS 10.13.4? 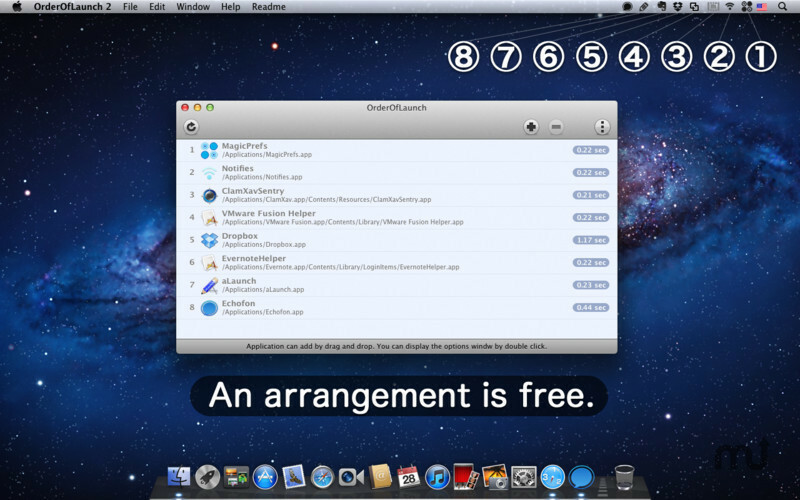 OrderOfLaunch is an application that can customize the order of the row of the menubar application of ".app" not to be able to permute after it launched. The applications launch in order registering in the list of OrderOfLaunch. The following applications launch after waiting for the icon to be displayed when it takes time to the display of the icon after the application is launched. You can always use the menubar application in same order of the row. OrderOfLaunch needs a review. Be the first to review this app and get the discussion started! OrderOfLaunch needs a rating. Be the first to rate this app and get the discussion started!